‘Painkiller – Redemption’, the newest addition to the Painkiller Universe. Continue the story of Daniel and Belial as they joined forces for the first time to end the bloody conflict between heaven and hell. You will discover all new maps, fight off literally thousands of demonic fiends, and lose yourself in the intense gameplay rounded off with an absorbing heavy metalsoundtrack. 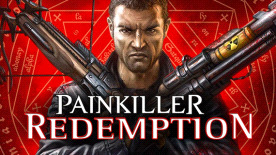 The newest addon brings the Painkiller franchise back to its roots. Breathtaking action, thousands of monsters and exotic weapons are a solid foundation for a Painkiller game. The game also features a tactical component; while reaching your objectives in each level, you unlock Tarot Cards, which will soon prove to be very helpful. In additional to that, collecting souls of fallen enemies will temporarily transform you into a mighty demon.